Central Toxic Keratopathy (CTK) is a rare, acute, non-inflammatory complication of laser assisted in situ keratomileusis (LASIK) surgery. Fraenkel and colleagues first described CTK in 1989 as being inflammatory in nature but the condition has subsequently been recognized as a non-inflammatory process. The corneal stroma is affected whilst the flap is spared. There are a number of theories about the factors that may cause CTK to develop but the exact cause is still ambiguous. The more popular suggestions in the literature include photoactivation of povidone-iodine by the excimer laser, laser-induced keratocyte apoptosis of corneal matrix, intraoperative exposure to meibomian gland secretions, marking pen ink, talc from latex surgical gloves, or post-surgical debris from the microkeratome blade. These signs typically begin to exhibit themselves 2 to 6 days post-operatively. The incidence of CTK after PRK and LASIK is 0.016%. The central corneal opacification in CTK begins as diffuse lamellar keratitis (DLK) on post-surgery day 1 or 2 and quickly gives rise to a dense opacification of the central corneal stroma. 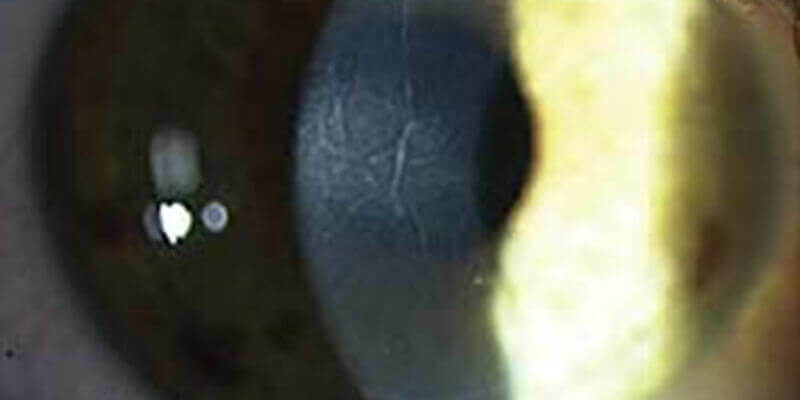 This corneal opacity and hyperopic shift characteristically persists for 2 to 18 months before spontaneously resolving. The characteristics of CTK does closely resemble a number of inflammatory and infectious conditions including contact lens-induced keratitis, infectious keratitis, post-photorefractive keratectomy (PRK) haze, epithelial ingrowth, diffuse lamellar keratitis (DLK), and corneal haze secondary to increased intraocular pressure. It is therefore extremely important to take thorough notes detailing history and symptoms. Scheimpflug imaging and optical coherence tomography (OCT) imaging studies can be useful diagnostic tools. 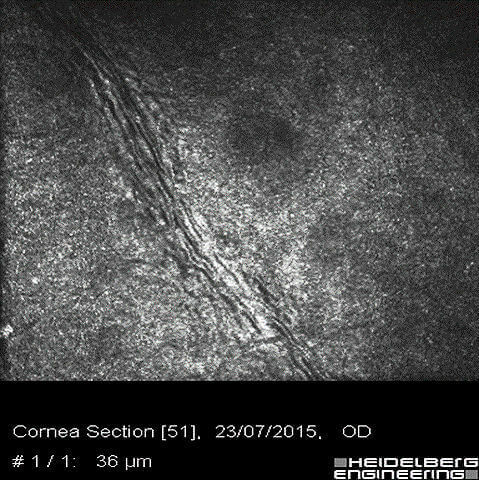 The exaggerated flattening of the anterior cornea can be demonstrated with Scheimpflug imaging. OCT can detect corneal thinning, backscattering centrally and higher internal reflectivity. As the centralised stromal haze spontaneously resolves and CTK is a non-inflammatory condition it does not benefit from medical intervention and the consensus it to monitor the patient closely. Steroids should never be used as it will make the condition worse.